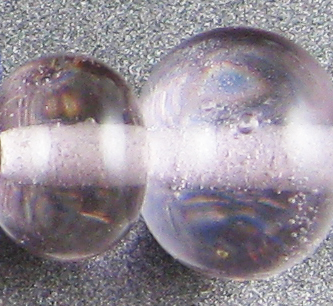 CiM Enchanted (CiM626) is a pale lavender-pink transparent. I found this colour a little boily/scummy, but not as troubling in that respect as the new CiM Venus, which I reviewed a few weeks ago. I found that Enchanted did not change colour when reduced (leftmost bead) and that it does have a bit of a tendency to boil and create bubbles. Working it cool helps to avoid this. Here is Enchanted both under my photo lamps and in natural light. You can see that it looks darker and pinker in natural light. All of the photos in this post (apart from the darker frame of this one) are all taken from the studio-lit photo. Here is Enchanted with Effetre Rosata Extralux, Pale Amethyst, Dark Lavender, and Pale Lavender Blue, and with CiM Pink Champagne. Enchanted is pinker than Effetre Dark Lavender in this studio-lit photo, but is around the same shade of pinkish lavender in natural light. 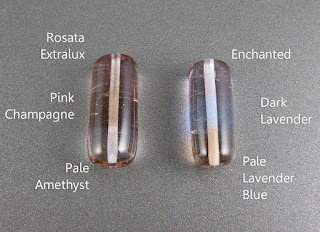 Enchanted is quite a bit more reactive with silver than Dark Lavender, which I found interesting since I thought they would work up similarly. Enchanted seems to fume a deeper rose colour with the addition of silver, and encasing silver foil with Enchanted will turn the silver foil golden. Effetre Dark Lavender did not substantially alter the colour of silver and didn't change colour itself when used with it. The leftmost bead where I used my reduction frit blend turned out sort of pretty, with the fritty bits developing diverse blues and purples, but they did that without getting any nifty outline and without developing much of a sheen. The other two beads did nothing worth discussing. 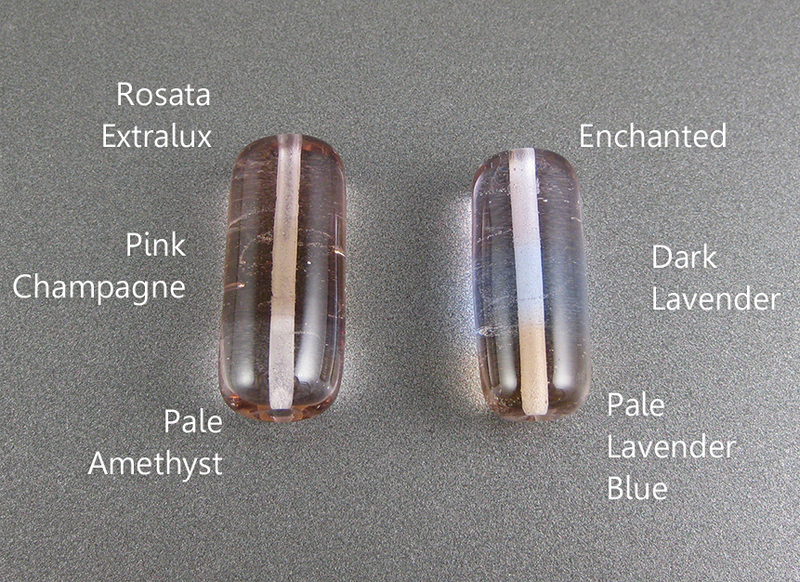 And while Enchanted is fairly reactive with silver, it's not very reactive with these other colours I tested it with. Apart from some separation of Copper Green and Ivory when they're used on top of Enchanted, I didn't observe much in this way. 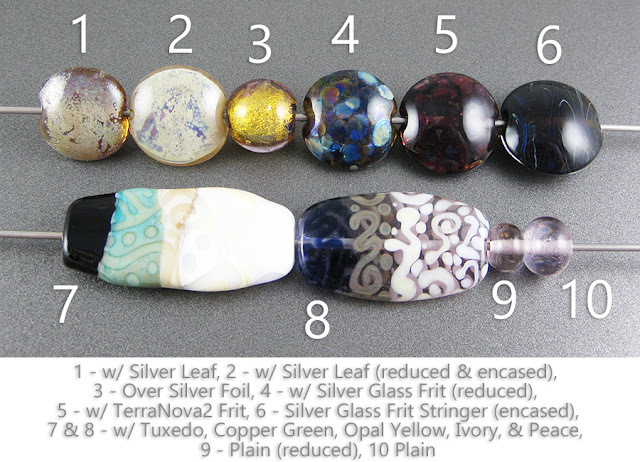 I didn't make any other beads with Enchanted yet, but if I do, I'll come back and update this with pictures. On the whole, I thought this colour was pretty, but I prefer the price, consistency, and workability of Effetre Dark Lavender. I'd choose this one instead only if I were planning to also work with fine silver and wanted the reactions.